In my previous piece for Interest , I wrote that government agencies’ response to the rising road toll was inadequate. The Ministry of Transport, the NZ Transport Agency and the Police each essentially blamed drivers. In this, my final piece on safety for a while, I want to acknowledge that not all agencies have been so defensive. I also want to raise concerns about a system that puts politicians, rather than users, at its heart. 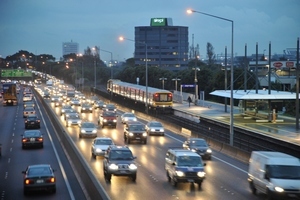 Auckland Transport (AT) recently published a commendable briefing for local boards  setting out several plausible contributors beyond driver behaviour. One factor is residential developments along roads intended for lighter traffic. Another is the increasing diversity of road users such as more cyclists, pedestrians and motorcyclists along with unforgiving cars and trucks. Whatever the true causes, there are many more variables at play than can be simply written-off as bad behaviour. The rising road toll is also an issue that can’t be untangled without intensive statistical analysis. That’s why I  called on  government agencies to hire statisticians who can. The Ministry of Transport and the NZ Transport Agency appear to have realised this. Both have recently advertised for the skills  that will help address the problem. However, while identifying what’s going on is a necessary part of addressing the problem, it is not sufficient on its own. If there are cost-effective interventions and we, as transport users and as communities, think the rising road toll is worth addressing, Government and its agencies still need to respond. If electrocutions increased 40% over four years, we’d expect electricity companies to look into why. And then to do something about it. Transport might differ from many other services due to the vast array of ways things can go wrong. But the apparently lethargic response was a concern. It turns out that government actually had a chance to act earlier. According to documents released under the Official Information Act , the Ministry of Transport advised the Minister (Simon Bridges) in late 2016 that the road toll was increasing. The Ministry also advised the Minister of options to improve safety. Such options included road improvements and more road safety education and advertising. Some council representatives worried about the impact of prioritising large road projects over smaller projects which could have a bigger combined impact. Concerns with…other good BCR [benefit-cost ratio] safety projects being pushed out. The Ministry's analysis supported councils’ concerns. The Ministry noted that many unfunded road safety improvement projects exist. In general, these projects have higher benefit-cost ratios than other projects. This meant that more investment in road safety improvements, funded by deferring other projects, would increase the overall economic and social return of transport investment. What did the Government do with the Ministry’s advice? The Ministry of Transport’s analysis informed the Minister’s deliberations on the draft Government Policy Statement (GPS) 2018. The GPS is the document by which the Government sets its objectives for land transport. The GPS also includes budgets for activities including state highways, local roads, public transport, walking and cycling, road policy, and road safety promotion. Funding for this expenditure comes from the National Land Transport Fund made up of petrol excise duty and road user charges. Increasing safety was one of many choices offered to the Minister during preparation of the draft GPS 2018. Other choices included a freight focus, regional development and resilience, and urban development. A final choice was to do away with Government direction. This option involved the NZ Transport Agency simply doing the projects with the highest economic and social returns per dollar spent, whether they were freight, safety or anything else. The former Government opted to continue with the focus set out in GPS 2015 and 2012. The Ministry’s documents describe that as ‘first and foremost about freight, commercial and employment outcomes, with safety and cost-efficiency as secondary outcomes’. These eight projects are, however, only the tip of the iceberg. They are the projects we can see because they made the cut. There will be many projects that didn’t make the cut because they didn’t align with Government priorities. Auckland Transport’s briefing, for instance, says there are 300 high-risk intersections in Auckland alone, but only enough funding to fix two or three. One constraint will be a lack of money from the National Land Transport Fund due to other Government priorities. How can people effect change? The current planning system for land transport allows Government to set direction. The former Government’s decision might align with your preferences. It might instead be that the new Government’s direction aligns with your preferences. It strikes me as strange, though, that we let government have such a strong say about transport. Why is transport provision responsive to government rather than the individuals, families, businesses and communities that use it? The former Minister even explicitly declined an option that would have seen projects of most value to users (projects with the highest benefit-cost ratios) pursued. As with the Labour-led government before them, the former Minister’s preference was to retain control. Over the next year, The New Zealand Initiative’s transport project will look at whether there might be other ways of delivering transport. Meanwhile, the new Government will look to issue its own Government Policy Statement. A draft will be prepared, and public consultation undertaken. If you are unhappy with the road toll or any other aspect of land transport, this will likely be your first and most important opportunity to express that over the next three years. *Sam Warburton is a research fellow at the New Zealand Initiative , which provides a fortnightly column for interest.co.nz.